Alexander Maggio, is a writer and producer on the CBS drama MADAM SECRETARY. He was part of the team that developed the story of "Night Watch" and figured out how to dramatize the danger of hair-trigger alert status. As an MFA graduate of UCLA, his thesis play, LOST CAUSE, was an Alliance/Kendeda National Graduate Playwriting Competition runner-up and an O’Neill Semifinalist. His theatrical work has been performed in New York, Los Angeles, Atlanta, Houston, Aspen and Santa Cruz. Before becoming a playwright, Alex worked as an analyst for the Defense Intelligence Agency in Washington, DC, and as Teaching Fellow in History for Andover Phillips Academy. In his spare time, he’s a trivia junkie trying to relive his glory days on JEOPARDY!, where he was a three-day champion. B.A. Yale University. 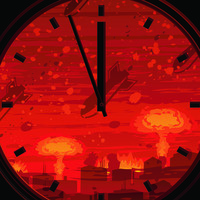 Vipin Narang, MIT nuclear security expert, associate professor of political science and a member of MIT’s Security Studies Program, will discuss the threat of nuclear war today. He received his Ph.D. from the Department of Government, Harvard University in May 2010, where he was awarded the Edward M. Chase Prize for the best dissertation in international relations. He holds a B.S. and M.S. in chemical engineering with distinction from Stanford University and an M. Phil with Distinction in international relations from Balliol College, Oxford University, where he studied on a Marshall Scholarship. He has been a fellow at Harvard University’s Olin Institute for Strategic Studies, a predoctoral fellow at Harvard University’s Belfer Center for Science and International Affairs, and a Stanton junior faculty fellow at Stanford University’s Center for International Security and Cooperation. His research interests include nuclear proliferation and strategy, South Asian security, and general security studies. Sign up for Starr Forum emails to get notified about upcoming events.